3. Five Members Each In Charge Of Traffic, Staff, Mechanical, Engineering, Civil Engineering, Electrical Engineering. The chairman Railway board is Ex- officio Principal Secretary to the Government of India in the ministry of Railway. He is solely responsible under the Ministry of Railway for arriving at decisions on technical questions and advising the Govt. of India on the matters of Railway policy. Financial commissioner for Railway represents the ministry of finance on the Railway board and also functions as Ex-officio Secretary to Govt. of India in the ministry of Railway in the financial matters. He has direct contact with the Finance Minister whom he keeps informed of development in minister of Railway. In case of any disagreement with chairman or Railway minister on any financial aspect, he has the right to refer to the Finance Ministry. Each of the members is responsible for dealing with all aspect of the technical subject of which he is in charge. In order to he able to effectively discharge the duties and responsibilities. There are also additional members in Railway board for smooth & effective working. Several Directorates each under an Adviser assists Railway Board, such as Adviser Works, Mechanical, Traffic, Commercial and Civil Engineering. Executive Directors assist such Adviser. For further coordination there exists Directors, Joint Direct, Deputy Directors and Assistant Director. The Advisers are responsible for issuing instructions direct to Railway administration including production units and other units controlled by Railway Board and receive and deal with reference from general public and other ministry, of Govt. of India with their respective jurisdiction. 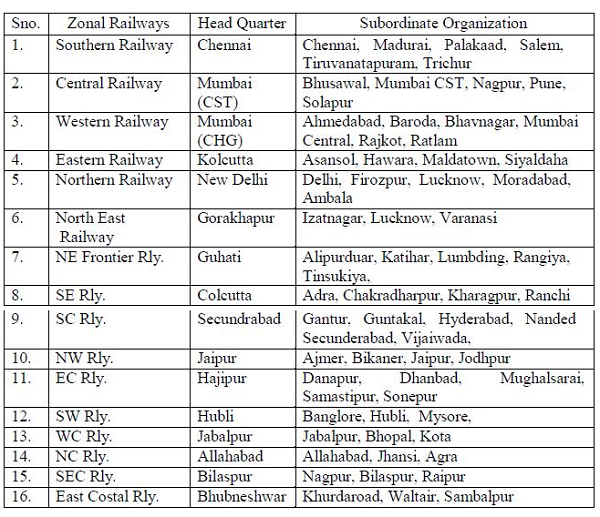 iv) Railway Zones & Management. 3. Indian Railway Institute Of Civil Engineering (IRICEN)- Pune. 6. Indian Railway Institute of Signal Engineering and Telecommunication (IRISET), Secundrabad. * Rly Bds notification No. E(RRB)2009/25/25 dtd 07/10/2009. 3) Mechanical - Chief Mechanical Engineer (CME). The above mentioned Head of department are responsible for functions of their department efficiency and are direct responsible for all matter concerning to their development. They have been provided with Deputy, Senior and Junior scale officer to assist them in discharging of their duties efficiently.